What are the risks of terrorism and what are their consequences and economic impacts? Are we safer from terrorism today than before 9/11? Does the government spend our homeland security funds well? These questions motivated a twelve-year research program of the National Center for Risk and Economic Analysis of Terrorism Events (CREATE) at the University of Southern California, funded by the Department of Homeland Security. This book showcases some of the most important results of this research and offers key insights on how to address the most important security problems of our time. 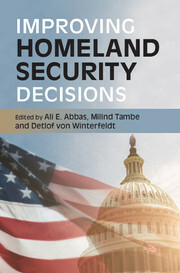 Written for homeland security researchers and practitioners, this book covers a wide range of methodologies and real-world examples of how to reduce terrorism risks, increase the efficient use of homeland security resources, and thereby make better decisions overall.